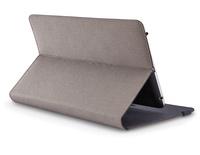 Tablet Case Lenovo A7 Folio Case & Screen Protector Grey 7"
Wear in style with a durable, made of high quality materials, case for Lenovo Tab A7 7" tablet. It fits perfectly to your equipment - helping to protect it from damage, scratches and unsightly dust. The advantage is to cover the soft padding, high-quality protective film anti-scratch and ultrasonic technology. Trendy, sober design combines functionality here, your tablet from providing not only solid protection, but also adding to the charm.